IBC’s Drug Discovery and Development Week was held in Boston on the first week of August, from August 3-6, 2009. This annual event, a highlight of the summer for the Boston biotech community, had always been called “DDT”, for “Drug Discovery Technology” conference. More recently, the name was changed to “Drug Discovery & Development of Innovative Therapeutics World Congress,” but the acronym “DDT” still stuck. This year, IBC changed the format of the conference, hence the name change. The new format no longer was as technology focused, but emphasized drug discovery and the translation of discovery into clinical studies and onto the market. With our consulting group’s focus on science and technology strategy, biology-driven drug discovery and development, and improving the effectiveness of pharmaceutical and biotechnology R&D, I naturally liked the change in format. IBC also intended the conference to focus on networking and discussion of real drug discovery, scientific research, translational medicine, and business issues. As far as I’m concerned, the conference fulfilled that purpose as well. It was good to meet with friends and colleagues old and new, and to have substantive discussions. Even the booths in the exhibit hall were populated with company executives and researchers, as well as salespeople. It seems that the exhibitors got the point of the new conference format. A highlight of the conference was the session on oligonucleotide therapeutics, focused on RNAi. At the conference, the RNAi biotech company RXi Pharmaceuticals (Worcester, MA) presented animal study data on its proprietary self-delivered rxRNA (sd-rxRNA) compounds, which are chemically modified RNAi molecules with self-delivering moieties. sd-rxRNAs are designed to be delivered to cells and tissues without a delivery vehicle. In vivo administration resulted in systemic delivery of sd-rxRNAs to the liver. There are many disease indications that could be potentially treated by specifically targeting disease pathways in the liver using oligonucleotide therapeutics such as sd-rxRNAs. sd-rxRNAs are compatible with subcutaneous administration, and thus might be self-administered by patients. The lack of the need for a delivery vehicle also potentially allows for lower manufacturing costs. I attended the Industry Leadership Forum on RNA therapeutics on August 4. It was like “old home week”, since many of the panelists and attendees had attended (or spoken at) the RNAi conference in Cambridge MA in January at which I had also been a speaker. When I got up to ask a question at the end of the session, panel moderator Jim Thompson of Quark Pharmaceuticals recognized me and asked me a question in return. One of the key discussions in the Leadership Forum concerned assessing progress in the therapeutic oligonucleotide field. Proof of principle has been achieved for aptamer drugs [pegaptanib (OSI/Eyetech/Pfizer’s Macugen) for treatment of age-related macular degeneration], and for antisense agents [fomivirsen (Isis/ Novartis Ophthalmics’ Vitravene), for treatment of cytomegalovirus retinitis in AIDS patients]. These are the two first oliogonucleotide drugs to reach the market, and both treat ophthalmologic diseases and are delivered locally. Another antisense drug, Isis/Genzyme’s mipomersen is a first-in-class apolipoprotein B (apoB) synthesis inhibitor currently in Phase III trials for treatment of homozygous familial hypercholesterolemia (FH). Miopomersen is one of Isis’ second-generation chemically modified antisense therapeutics. These compounds preferentially traffic to the liver when injected intravenously, without the need for a delivery vehicle. The panel at the Leadership Forum predicted that an approved oligonucleotide blockbuster drug, which is likely to be a locally delivered or a liver-targeting drug, is about 2-3 years away. The approval of Quark’s systemically delivered kidney-targeting RNAi drug QPI-1002 (for acute kidney injury) may occur soon thereafter. The first microRNA drugs may be approved a year or two after that. Other systemically delivered oligonucleotide drugs that target organs and tissues other than liver or kidney are “a long way off”, and the timing of their appearance is difficult to predict. This is typical of a technologically premature field, as discussed in our earlier blog post. Early formulations of oligonucleotide drugs may also fail in Phase III, thus thwarting the panel’s predictions. The panelists agreed that it is important to target the “low-hanging fruit” (i.e., products that are locally delivered or target the liver or kidney) first in order to get the momentum of the field going. However, researchers and companies should also look at other targets, especially if they are developing novel enabling technologies in drug delivery and/or in design of therapeutic oligonucleotides with enhanced potency and specificity. 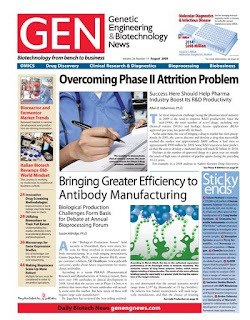 Genetic Engineering & Biotechnology News (GEN) featured my new article, entitled “Overcoming Phase II Attrition Problem”, on the top of Page One of its August 2009 edition. Here is an image of Page One of the August 2009 issue. And here am I, at the IBC Drug Discovery and Development Week conference (formerly known as DDT) in Boston, on Tuesday, August 4, holding a copy of the August issue. Thanks to Keri Dostie of IBC for taking this photo. The article discusses the most important challenge facing the pharmaceutical industry today, the need to improve R&D productivity. It outlines leading-edge strategies for reducing pipeline attrition and for increasing the number of drugs that reach the market and that address unmet medical needs. If you need a more in-depth exposition, you may have your company order a copy of our May 2009 book-length report, Approaches to Reducing Phase II Attrition, an Insight Pharma Report published by Cambridge Healthtech Institute (CHI). The GEN article is based in part on that report. You may discuss issues raised by the article or the report by leaving a comment on this blog post. Thanks are in order to those who helped make the GEN article a success. Four industry executives were quoted in the article– Charles Gombar and Evan Loh of Wyeth, Bruce H Littman of Translational Medicine Associates, and Peter Lassota of Caliper Life Sciences. (Full transcripts of interviews with these and other executives are included in an appendix to the CHI Insight Pharma report.) Drs. Littman and Lassota also reviewed the article prior to publication. Hearty thanks also to those who served as editors of the article—Laurie Sullivan and Al Doig at CHI and John Sterling and Tamlyn Oliver at GEN. Producing a lead article for GEN (or for other publications) requires an extra level of effort from editors as well as authors, so thanks to all who participated in this effort.